Dr. Jeff is back in business. Animal Planet has announced new episodes of Dr. Jeff: Rocky Mountain Vet are coming in April. The docu-series follows the real-life cases of Denver-based veterinarian Dr. Jeff Young. 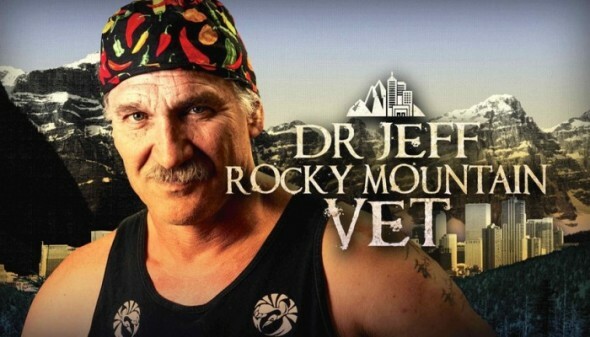 Season two of Dr. Jeff: Rocky Mountain Vet premieres on April 16th at 9 p.m. ET/PT. (Silver Spring, Md.) – Denver’s most passionate and persevering veterinarian is back – flip flops, long hair, tattoos and all – to tackle high-stress situations when Animal Planet’s DR. JEFF: ROCKY MOUNTAIN VET returns for 12 all-new episodes beginning Saturday, April 16, at 9 PM ET/PT. The cases are more intense than ever when Dr. Jeff Young and his team go to great lengths to save the lives of both beloved pets and rescued wild animals. This season, they treat more mysterious illnesses, perform surgeries on creatures including little foxes and big cats and rehabilitate rescued animals before they find forever homes. There is no animal this team won’t try to save, even if it means leaving the modern-day conveniences of the clinic and traveling high into the Rocky Mountains to get to them. The challenges of running one of the busiest clinics in the country are heightened when Dr. Jeff must deal with health issues of his own. Dr. Jeff’s sharp surgical skills and philosophy of always putting animals first make him one of the most respected veterinarians in the country, and this powerful series captures some of the riveting real-life cases that come through his doors. Cameras reveal the often tense and chaotic atmosphere at Dr. Jeff’s vet clinic Planned Pethood Plus but fortunately, Dr. Jeff’s presence provides calm to his anxious patients. With 25-plus years of veterinary experience and thousands of surgeries under his belt, Dr. Jeff guides a dedicated team of more than 30 veterinary staffers as they respond to the frenetic energy with precision, compassion and skill. What do you think? Did you watch season one of Dr. Jeff: Rocky Mountain Vet? Will you watch the new season? I watch all animal shows, but Dr. Jeff is my favorite. He is a wonderful man. I have never missed an episode. Hoping all is well and we see him in April. I love this show. I keep watching every episode over and over. Do hope there will be new episodes coming. I have been watching this show since day one. I have now probably watched each episode at least 10 times each! Dr. Jeff and his staff, plus their emphasis on low-priced, high quality service should be the bar every vet should strive to reach. Dr Jeff should be a role model for all future and currently practicing Veterinarians. The care and passion he and his staff display for animals is phenomenal. I love his show and hope to see new episodes soon! Where can I find out if Dr. Jeff will be returning in 2018? Where can I find out if Dr. Jeff is coming back in 2018? NOT 2016 or 2017 but 2018! I love Dr. Jeff it is the best .Please keep having it on all the time. I like watching it very time it’s on. I hope you bring back Dr. Dee from Alaska I like that one too. Love the show hope it comes back again.